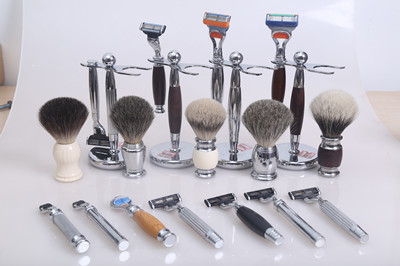 Product categories of Shaving Brush Set, we are specialized manufacturers from China, Shaving Brush Set, Mens Shaving Kit suppliers/factory, wholesale high-quality products of Straight Razor Kit R & D and manufacturing, we have the perfect after-sales service and technical support. Look forward to your cooperation! Shaving Brush Set: The shaving brush set include shaving brush, shaving stand, shaving bowl, shaving razor. We can provide the shaving brush set with different materials, such as the stand, we have metal, wooden,, plastic, and resin etc. And the bowl we usually have metal, plastic bowl, the razor we have 3 blades and 5 blades. We also accept add your own logo on the shaving set.